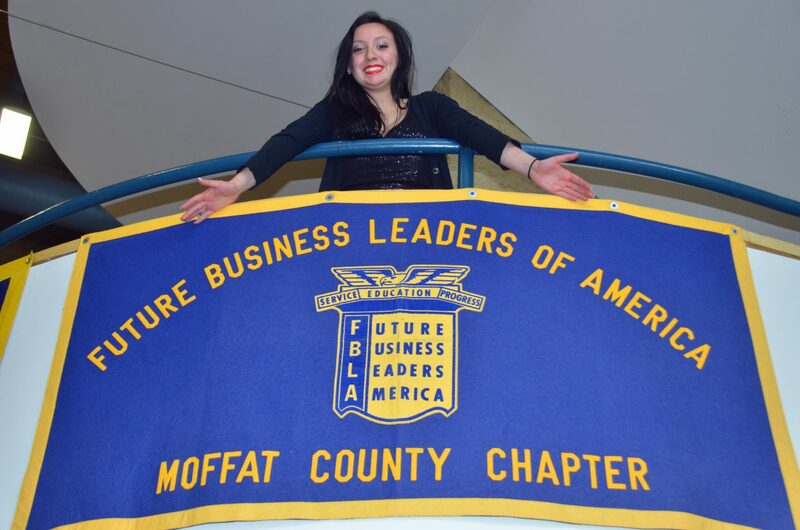 Moffat County High School senior Elisa Teeter displays the banner for the school's chapter of Future Business Leaders of America. Teeter, the outgoing president of FBLA and DECA, recently placed first in Business Procedures at FBLA's state event, the first MCHS student to rank that high. She will attend the national competition in June in Nashville, Tennessee. The following Moffat County High School students recently competed at the state level in Vail. Elisa Teeter was the only MCHS student to place in her category, winning first place and the opportunity to attend the FBLA national competition in June in Nashville, Tennessee. 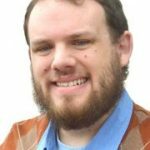 Craig — Many grown adults couldn’t tell you some of the basic information needed to survive in the business world, let alone a typical high school student. That statement doesn’t apply to Elisa Teeter and her crowd. Teeter, a Moffat County High School senior, recently finished in first place at the state level of the Future Business Leaders of America in the Business Procedures category, a win that will send her to the national competition. Although MCHS has sent 12 students to nationals in the past nine years, this is the first time one of the Bulldogs has gotten first place at state, said Krista Schenck, adviser for FBLA and adjacent program DECA. “She’s our first, first” place winner, Schenck said. During the state conference held April 27 to 29 in Vail, most of the six MCHS students who attended, as well as kids from many other schools, were hit by norovirus. “We came home sick, but we came home very happy,” Schenck said. Teeter was among those who was afflicted by the bug. Teeter said the competition essentially was just a 100-question test, similar to the SAT, covering workplace ethics, finances and more. “It had everything, kind of,” she said. The national competition for FBLA will take place June 28 to July 2 in Nashville, Tennessee. Teeter and Schenck will travel to the event. Teeter said she looks forward to meeting people from across the country with the organization, but until then, a lot of preparation will be squeezed into those six weeks. “It’s more challenging, but the rewards are bigger because they usually give scholarships for the people who place,” she said. Shortly after nationals, she will attend orientation at Virginia Tech, where, partly thanks to FBLA and DECA, she already knows what she wants to study: hospitality and tourism management. Teeter also is the outgoing president of the FBLA and DECA chapters for MCHS. “I’ve gotten a lot of leadership skills, speaking skills, planning skills and time management, and I think I’ve learned a lot from Mrs. Schenck herself — not just business skills but life skills,” she said. Schenck was beaming with pride Tuesday night at a celebratory banquet for all the FBLA and DECA members, including awards, letters and induction of new officers. Only four FBLA seniors are leaving MCHS, meaning the numbers still will be strong next year. “They’re an amazing group of kids, and I love traveling with them because they’re so well-behaved and professional,” she said. As far as the student she’ll join in Nashville this summer, Schenck said Teeter’s accomplishment comes at the end of a lengthier FBLA/DECA career than most students. “Rarely do we have somebody that starts their freshman year and does it the whole way, so it proves if you stick it out and work hard, that senior year can be amazing,” she said.